“Her Mother Had Smelled Of Cold And Scales, Her Father Of Stone Dust And Dog. She Imagined Her Husband's Mother, Whom She Had Never Met, Had A Whiff Of Rotting Apples, Though Her Stationary Had Stunk Of Baby Powder And Rose Perfume. Sally Was Starch, Cedar, Her Dead Grandmother Sandalwood, Her Uncle, Swiss Cheese. People Told Her She Smelled Like Garlic, Like Chalk, Like Nothing At All. Lotto, Clean As Camphor At His Neck And Belly, Like Electrified Pennies At The Armpit, Like Chlorine At The Groin. She Swallowed. Such Things, Details Noticed Only On The Edges Of Thought Would Not Return. 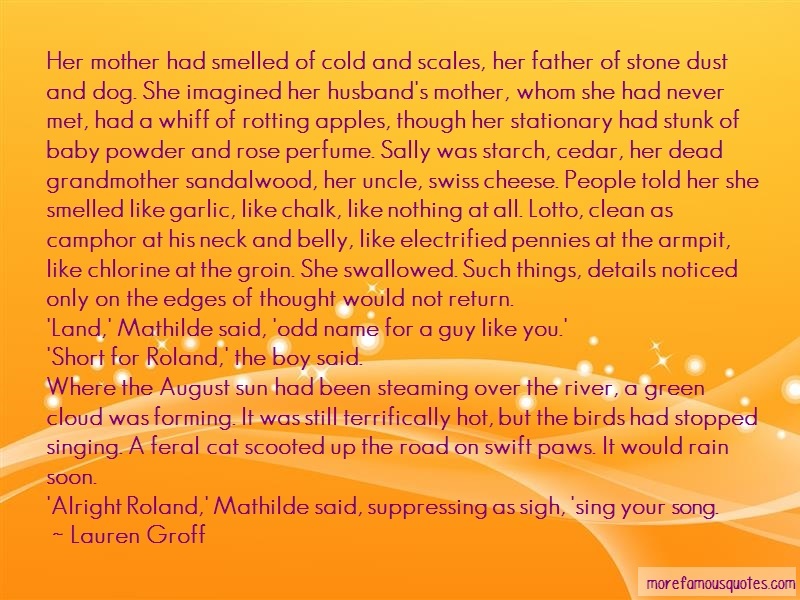 'Short For Roland,' The Boy Said. Where The August Sun Had Been Steaming Over The River, A Green Cloud Was Forming. It Was Still Terrifically Hot, But The Birds Had Stopped Singing. A Feral Cat Scooted Up The Road On Swift Paws. It Would Rain Soon.